Polework can be described as any number of gymnastic exercises performed over or around poles on the arena. Whilst it is often associated with an introduction to jumping, the benefits of regular polework can have a positive impact on the health and wellbeing of all horses, regardless of which arena they are destined for. The use of poles can be likened to a pilates class. When done correctly, it strengthens the core muscles, which stabilises the horse’s back and pelvis, increases suppleness, through increased range of motion of the joints and supporting tissues, and helps develop the horse’s balance and musculature, by challenging the horse’s comfort zones. Of course, there are many other benefits to regular polework, including, but not limited to, co-ordination, engagement, confidence, rhythm and stride control. The exercises that can be used for polework are only limited by your imagination, but for the sake of this article, I am going to stick to three of my favourites. 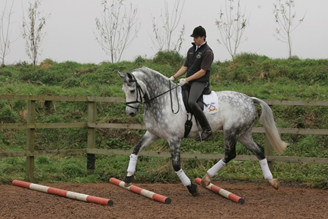 Before I go into these in detail, it is worth noting that whilst these exercises can help make the abovementioned improvements in the horse’s way of going, they require the horse to be moving forward in a regular rhythm, with a secure contact and with the rider able to maintain a balanced seat. I tend to encourage a slightly forward, light seat, to allow the rider to stay in balance with the horse, should it lose rhythm or balance. The distances generally used for most horses are listed below. I tend to set these to the middle section of the poles when setting lines up. Keep in mind that these distances are only a guide, and may be tweaked to suit the individual horse, if you find it is struggling to maintain its rhythm. I use 3m treated pine poles and like to paint them in 3 or 5 sections, to give a point to aim for on the poles during the exercises. It is important to also anchor the poles, using sand, pole pods etc, to stop them rolling around. This is an ideal introduction for most horses, whilst they learn to move in balance over the poles. It can be ridden in walk, trot and eventually canter. The rider should start with a single pole, and progress to any number in sequence. When ridden correctly, straight poles encourage the horse to lift his core, and subsequently his back, and allow the shoulders and hindlegs to lift and carry beyond the horse’s normal stride range of motion. As the horse’s balance and confidence develop, the rider can alter the distance between the poles, to encourage a shorter or longer stride, and lift one, or both ends, to create even more rotation of the joints, and by adding extra poles to challenge the learning. The rider should always aim to maintain the rhythm through the line, and aim to keep the horse centred before, during and after the poles. The use of cones or guide rails as a “tunnel” before and after the poles can help achieve this. An excellent progression of the first exercise, is to move on to sequence poles on a curved line. My favourite layout is a “fan”, where the rider aims to guide a horse through the same point on each pole, whilst maintaining the bend and rhythm throughout. This exercise further increases engagement and suppleness, as the horse must lower the inside hind leg and draw it further under the body, whilst maintaining an increased reach through the outside of the body. This results in increased rotation, both longitudinal and lateral through the coupling, and increased rotation of the trunk. This exercise can be done in walk, trot and canter, and I like to set the middle of the poles to the horse’s normal stride length, then use the narrower and wider sections to increase the difficulty, through longer and shorter strides. The poles can also be raised on one or both ends, to further challenge the horse and further increase suppleness and balance. One of the biggest challenges with this exercise is the rider’s ability to maintain their line and guide the horse through the same section of each pole. The rider must keep the eyes up and looking where they want to go, and keep the shoulders turning and following the path the horse should be following. They must also have a very clear outside connection, to guide the horse around, and effective inside aids, to create and maintain the bend. My final exercise is all about the rider’s ability to count and control the strides. Once again, this can be performed in walk, trot and canter, and the poles can be set at any number of strides apart. This exercise is an excellent way for the rider to get a good feel for how much ground the horse covers in each stride and is a very useful tool for training longer and shorter strides. Poles can be on the ground, or slightly raised, and this exercise can also progress onto curved lines. Knowing how many strides the horse should be taking, and where, is essential for control in both the jumping and dressage arenas. 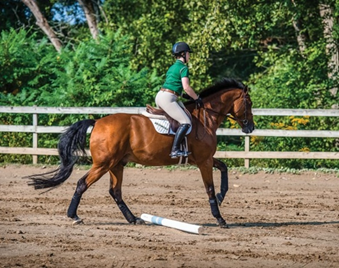 The ability to regulate the rhythm and the use of effective half halts are basic skills that all riders must master, and although this exercise may seem simple, getting the horse to the poles consistently on an even stride can be very challenging. Once the rider can perform the exercise in the set number of strides, they can start to play with adding strides, through the use of half halts to shorten and elevate the strides, and also lengthening the strides, through a more forward driving leg aid and more swinging seat. 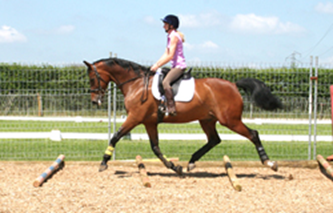 There are many excellent pole layouts and exercises available online, and once you have mastered the basic exercises, you can really have some fun, challenging yourself and your horse. You are only limited by your imagination (and number of poles of course!) as to what you can set up, so I hope you all have some fun cross training your horses and enjoying the benefits it brings!